Structural Geology and Resources 2012 | Geoconferences (WA) Inc. Thanks to the JH Lord Travel Grants, I am honoured to be the only student at the structural geology and resources symposia held in Kalgoorlie 26-28 September 2012, which was co-organised by Australian Institute of Geoscientists. The conference is well organised and consists of several interesting and informative talks within the three days program. 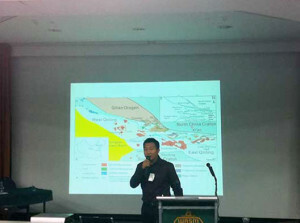 Several talks cover different types of commodities in different mineralization styles, and digital mapping verse traditional trace paper mapping in the field were one of the hot-debated topic, which for me it is just like the debate about whether or not newspaper will be eventually replaced by internet. The conference provided me a fantastic opportunity to present part of my PhD study and network with both academia and industry people who share similar interests in structure geology application in resource industry. My talk “how intrusion localized gold mineralization in the Zhongchuan Granite in West Qinling Orogen, Central China” was well received and arose several questions. This presentation also gave me great exposure to market myself as I am approaching the completion of my degree. Several important connections have been built up and maintained during and after the conference. In addition, as there are two geologists coming from China, we had good time to catch up. In total, this Kalgoorlie conference is a real pleasant experience for me and I cherished this opportunity and made most of it. Thanks again to the JH Lord Travel Grants.